We hope the first problem can be solved without too much work, and occurs just before a messier problem. This close positioning nudges kids to consider the relationship between problems and not treat them as separate and unrelated. Of course a challenge problem in one string might eventually become a helper problem in another string. What defines helper and challenge is their relationship to each other and to a big idea of the string. There are a bunch of helper problems that you might use to solve any messy problem. 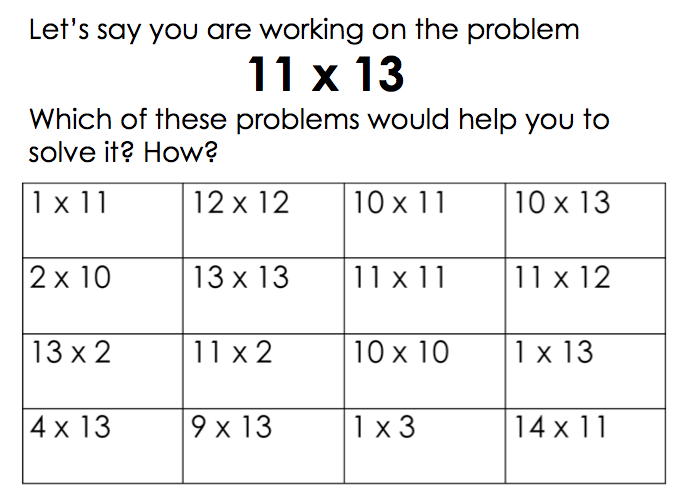 So this got us thinking about how to encourage students to be really flexible in their thinking and to develop helper problems on their own that worked for the problem at hand. So, we developed a task, connected to the ritual of strings, in which the class first sees a messy problem and then a collection of helper problems. Their task is to think about which combination of helper problem they would use to solve the messy problem. First there is think time, then the teacher tries to elicit a few different combinations. As students explain to the class how they used each set of helper problems, the teacher is modeling on the appropriate model, here an open array. Our goal, eventually, is to pose messy problems to students without helper problems and have them develop their own. We thought this might be a nice scaffold along the way. I like the way this task flips the typical number string on its head. 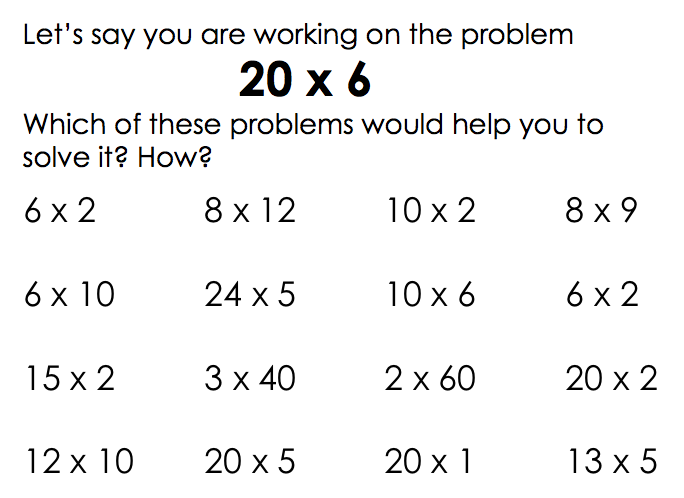 After some experience with number strings, students are ready to have some of the scaffolding taken away and start thinking about what good “helper problems” would be. 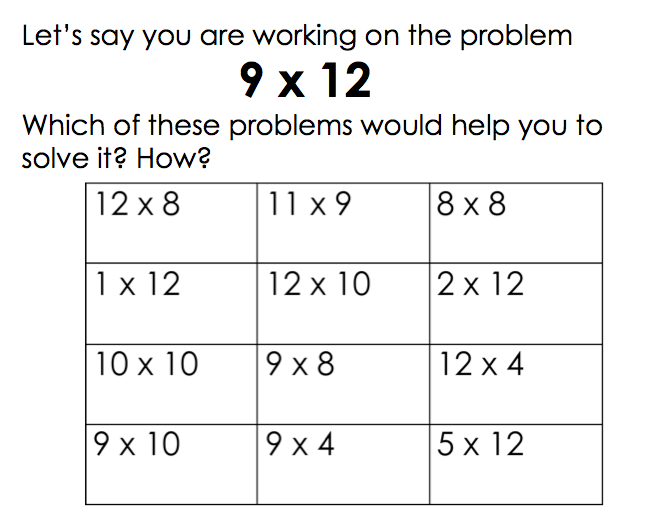 This got me wondering what a similar task would look like when applied to subtraction, linear modeling, or simplifying radical problems. I can imagine a similar task for subtraction where instead of solving the messy problem (e.g., 8900 – 1998) you do some “smart sliding” on the number line to rename the problem 8902 – 2000. And maybe there’s a set of other helper problems to choose from. Let’s — you and me — think about what a linear modeling and simplifying radicals task might look like. I have a few ideas. And while you’re fresh from the Pam Weber Harris numeracy workshop, perhaps you will be inspired to enter the strings contest, too.